Kingdom Hearts ? [chi] - View Cutscenes in Theater Mode! 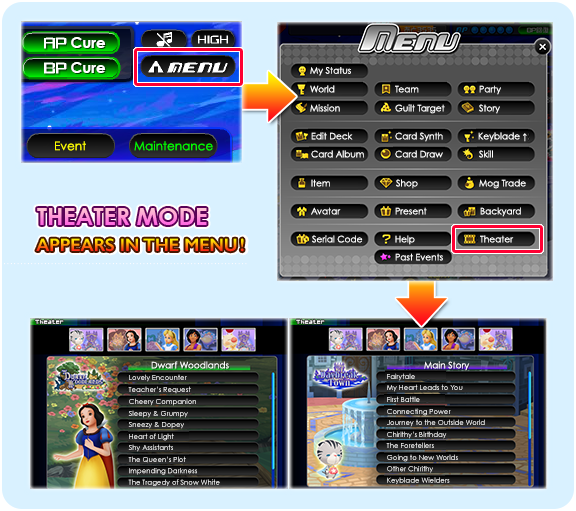 Theater Mode is a great addition that was featured in many KINGDOM HEARTS games and now that feature is also available for players in KINGDOM HEARTS χ[chi]! In the maintenance report for February 26th, it describes that you will be able to view cutscenes you have previously viewed as well as those from special events. Theater Mode has categorized its scenes by the main storyline and Disney worlds. Scenes will depict your avatar in your current equipment and it is encouraged to view these scenes again with different equipment. Translations of the update have been provided below! New Feature: View scenes in Theater Mode many times!! In 2/26 (Thurs)’s maintenance, you can enjoy event scenes in this new feature that will appear! You can review the story in 'Theater Mode’. ※ Images shown are currently in development. ● For ‘Main Story’ and ‘Disney Worlds’ event scenes, they will be available after clearing the story and have already seen them. Furthermore, for previous event scenes from event periods, they all can be viewed. ● In ‘Theater Mode’, your avatar will appear and coordinate with the clothes you are currently wearing. Because various things will coordinate, please view back on the story by all means. We will be subtitling these cutscenes and posting them on our YouTube channel! If there's any other related content you would like to be subtitled, please let us know! Be sure to also follow us on @Daybreak_Town for tips, update, and guide notifications on Twitter. In addition, don't forget to follow Kingdom Hearts Insider on Twitter, Facebook, and Tumblr for the most up-to-date updates on Kingdom Hearts -HD 2.5 ReMIX- and Kingdom Hearts III! Awesome! Really hoping they bring something Chi related to the west some time in the future (aside from the brief mentions in the Coded movie). Maybe this theater stuff can be included in something down the road. Yeah maybe they could bring over Chi's Theater Mode in some sort of collection in the future... but not sure but hopefully. Which cutscenes were reordered, Shard? By the way, how are the Special Event videos appearing for people who were not in the event? Are they not there at all? There by default? There for some but not for others, implying it's unlocked at some point? Does the inclusion of event stories mean they're canon? Event stories like the Crystal of Light is available for everyone. Scenes that are obtained by clearing story missions must be cleared before it will show up in the Theatre. I can see why the Crystal of Light events would be available for everyone since those newer players couldn't do them. Thank you so much Shard! I was trying to read them but they were so small but these helped! I've updated the image above. I checked not everything so far but for example Dwarf Woodlands has the Evil Queen cutscene before the world's intro and the birth of Chirithy is part of the main story, while the guilt introduction scene that actually came before it is not even part of the side story now but simply forgotten. Huh, that is strange. I can get the Birth of Chirithy being moved there, but the Guilt scene is kind of important as an introduction to (I presume) Nightmare Chirithy, and I'm surprised it's missing entirely! the game would be totally p2w and u would get nothing like you get now for free ever... western companies should never be allowed to host a f2p game. They suckt at doing. Nice! I was hoping this would be added soon. Now it'll be easier to keep up with the story. Honestly the only reason I'd use this is to listen to the new music. The story isn't that hard (or interesting enough) to rewatch.